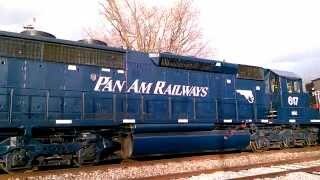 I was tipped off by a railfan last night that a Pullman car was interchanged with pan am. 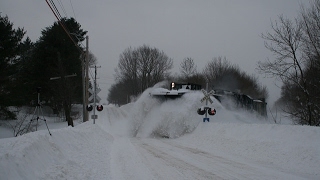 Thinking that it was on this train I rushed to Pittsfield, just to find a bigger surprise! 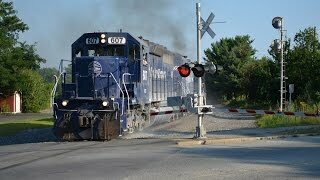 Pan am railways SD40-2 614 former Clenchfield rr SD45-2 3616 which later became Seaboard 8974 and MEC 3401 (GMTX Owned) a SD40-2 built for the Quebec North Shore and Labrador railway as there 247. I then rushed to the industrial park and got them there, I almost got them at Webb road but was too late. 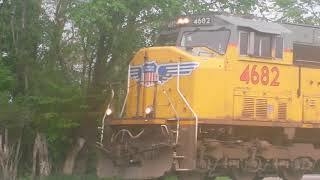 I met up with Mainerailfanner and a few other railfans at Snakeroot rd. after I went to Johnson Flat rd. In Burnham. We were running low on gas at Mc Allister rd. so we rushed to the gas station to miss them at Clinton. We them proceeded to Bellsqease rd. (Cannan rd) in Benton. We set up at the unused double track now used only to stash OOS cars. I barely made it there, the snow caused some tripod issues. Then I went to River road, in Fairfield. 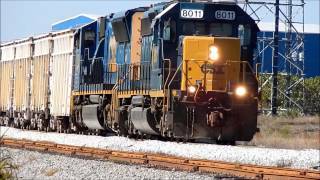 I noted a odd double set of search lights which the newer set was never hooked up and the signals turned away. I shot from a old abandoned spur which is now removed from the main. Next shot was Burill street, in Fairfield. 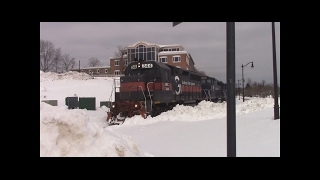 At the end of the chase you see a few shots around Waterville Yard. 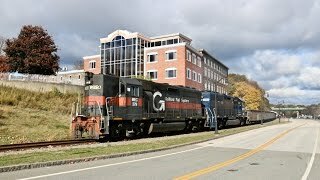 Then the last clip is of WAMA with the Boston and Maine heritage unit GP9 leading at Carmel, ME and I got a few toots. 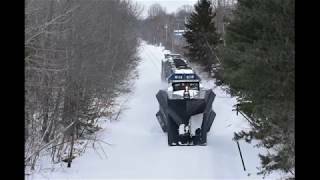 *NOTE* Pan am normally uses GP40 variants for these runs north of Waterville, due to a huge lack of power; GP9's, and SD40 variants where used over the past few days.